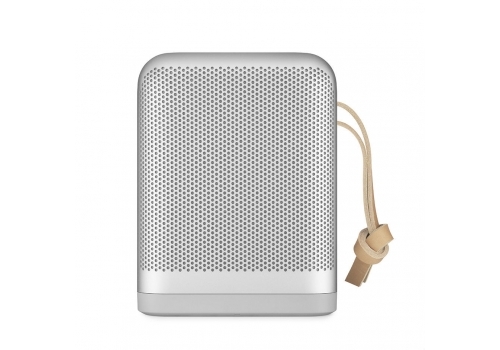 Beoplay P6 Premium, powerful and portable Bluetooth speaker. Sound Rich and impressively powerful For a compact speaker, P6 delivers a rich and impressive amount of power relative to its size Thanks to the large volume in the cabinet and an additional amplifier, a powerful bass leaves you with an impactful speaker – while True360 Bang & Olufsen Signature Sound ensures even sound all around. Authentic and beautifully crafted Pearl blasted aluminium and leather Attention to detail in the design and materials is prominent in P6. The beautiful craftsmanship of the splash and dust resistant speaker pushes the limits of aluminium as a material – while the double layered leather strap gives a warm contrast to the aluminium grill and makes it easy to carry. Design Inspired by an icon Strong Bang & Olufsen heritage references Beoplay P6 is designed by the award-winning Danish designer Cecilie Manz, with unique attention to detail and with existing production techniques constantly challenged. Integrated flex buttons, inspired by the iconic Beomaster 6000, offer precision, simplicity and a pleasing tactile experience. A beautifully crafted hole pattern design on the aluminium grill allows sound to be spread evenly. Performance Up to 16 hours of battery life Take the music with you for longer With battery life of up to 16 hours, P6 delivers an impressive amount of power relative to its size. This longevity allows you to bring the music with you around the home or on the go. With a USB-C charging cable, the product can easily be connected to a power source and recharged in 3 hours – well in time for its next adventure. Features One button. Many functions. Easy access to all your favourite features The OneTouch button can be customized to fit your needs. Use it to play and pause instantly or resume last played music source. Use the same button to take calls, access Siri or Google Assistant or activate your favourite sound profile from ToneTouch.